Please join us for a day of remembrance. 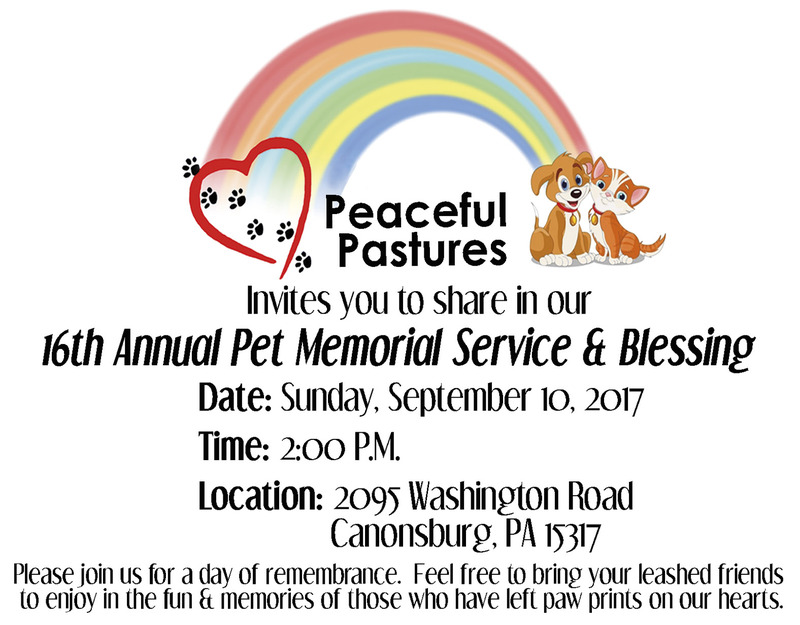 Feel free to bring your leashed friends to enjoy in the fun and memories of those who have left paw prints on our hearts. Pastor Brandon White will officiate the memorial service and pet blessing. We will also be joined by PVSEC, Pittsburgh Veterinary Specialty and Emergency Center, a new 24 hour emergency/ specialty vet to the area of Washington. Remy, Owner/founder, Cherished ones, will also attend and display her products, Pet Perennials & Healing Hearts Candles. Please call 724-745-8502 with questions. We hope to see you there!